Chairing a council meeting, he said anyone who failed to comply with US sanctions would "face severe consequences". America is re-imposing sanctions after pulling out of an international deal on Iran's nuclear programme. 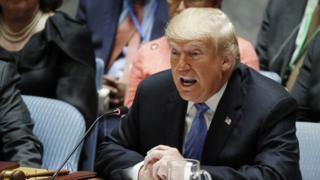 Iran hit back by accusing Mr Trump of "abusing" the Security Council. French President Emanuel Macron, who still backs the 2015 deal, called for a "long-term strategy". "I agree with the goals of the president of the US even if we disagree over the nuclear deal, but I think we need to build together a long-term strategy and it can't just boil down to sanctions and containment," he told the Security Council session. 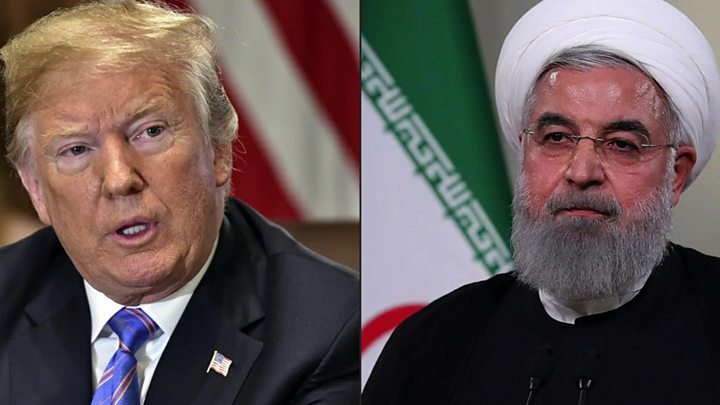 Iran denies it is seeking to build nuclear weapons and accuses the Trump administration of "bullying". The US president is chairing the session on Wednesday because America currently holds the rotating presidency. 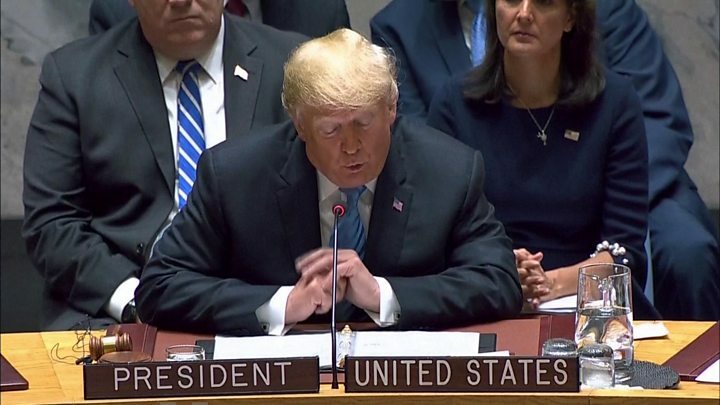 "I ask all members of the Security Council to work with the United States to ensure the Iranian regime changes its behaviour and never acquires a nuclear bomb," he said. He also accused Iran and Russia of "enabling" "butchery" by the Syrian government although he thanked all three countries for pulling back from an offensive against rebels in Idlib province. The 2015 deal lifted sanctions in return for steps by Iran to reassure the world it was not seeking to develop nuclear weapons. How does Iran defend itself? Its Foreign Minister, Javad Zarif, said in a tweet that the US had only become further isolated after abandoning the deal, formally known as the Joint Comprehensive Plan of Action (JCPOA), and the relevant Security Council resolution. "The United States of America one day, sooner or later, will come back," he said. "This cannot be continued." "What Iran says is clear," he added. "No war, no sanctions, no threats, no bullying. Just acting according to the law and the fulfilment of obligations." The remaining signatories in the nuclear deal - the UK, China, France, Germany and Russia - say they will set up a new payment system to maintain business with Iran and bypass US sanctions. US Secretary of State Mike Pompeo condemned the idea as "one of the most counterproductive measures imaginable". What did Trump say about China? The US president accused Beijing of attempting to "meddle" in the forthcoming US mid-term elections to prevent his Republican party winning. Without presenting any evidence to support his allegation, he said China did not want them to win because he was the first US president to challenge China on trade. Addressing the council afterwards, Chinese Foreign Minister Wang Yi rejected "unwarranted accusations". "We did not and will not interfere in any country's domestic affairs," he said. "We refuse to accept any unwarranted accusations against China." Mr Trump made no mention in his speech on Wednesday of alleged Russian cyber meddling in his favour during the 2016 US presidential election campaign, which is the subject of an ongoing US federal investigation. What did Trump say about Israel? At a meeting with Israeli Prime Minister Benjamin Netanyahu before Wednesday's session, Mr Trump said he thought a two-state solution was the best option for Israel and the Palestinians. He added that it was a "dream" for him to unveil a peace plan by the end of his first term. The Trump administration has previously said it will support a two-state solution if both parties agree to it.